Once your take cancer cells out of a living body, the cancer cells die, right? So how researchers study cancer? One way researchers study cancer is by using “cancer models.” Cancer models are clumps of living cancer cells that exist either in a lab dish (see image above), or in animal models such as mice. Sometimes these models also include other living cells from the host environment. It’s not exactly the same as studying a living cancer in its human host, but it does allow researchers time to study the biology of a cancer and test different treatments against it. T1: What are cancer models? What types of cancer models are currently used? 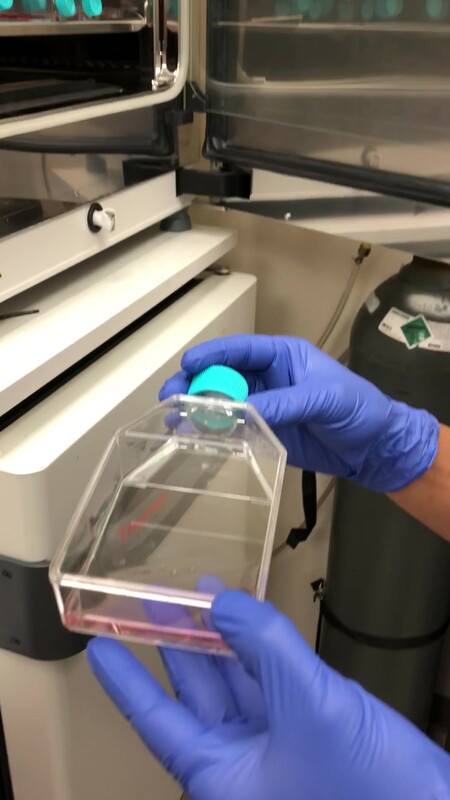 T2: How are cell lines created, and how are they used in research? T3: How are Patient-Derived Xenograft (PDX) mice models made, and how are they used in research? T4: What are the advantages and disadvantages of the different types of cancer models? T5: Where can we learn more about cancer models and support research with cancer models? Hope you will join us for this tweetchat on November 29 at 5pm Pacific, 8 pm Eastern. Please remember to include #LCSM in ALL your tweets so the other chat participants can see them. If you need a refresher on how to participate, read our primer on participating in the chat . Note that some tweetchat apps (like tchat.io) will not display tweets longer than 140 characters. This work by Janet Freeman-Daily is licensed under a Creative Commons Attribution-NonCommercial-NoDerivatives 4.0 International License.